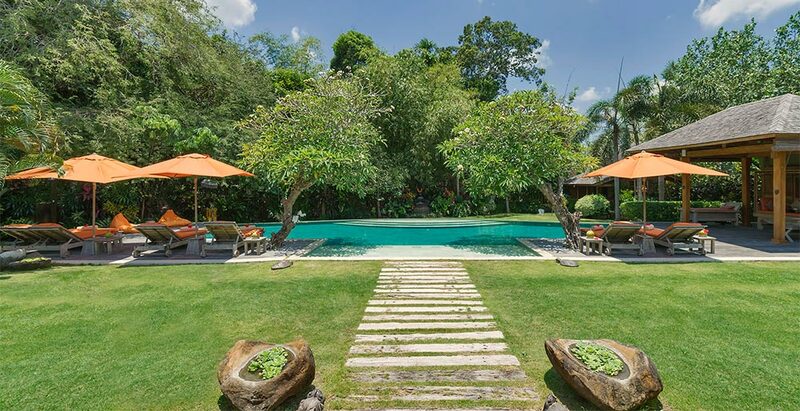 Villa Kavaya is a 5-bedroom fully-staffed colonial style villa in Pererenan, Canggu, Bali. This villa boasts vast tropical gardens, a huge swimming pool, a relaxation joglo, barbecue facilities, outdoor sitting area, fully air-conditioned indoor living with 46-inch LCD TV, WiFi connection throughout the villa, dining table for 10 guests and well-equipped kitchen. All 5 rooms have ensuite bathroom and are appointed with a 32-inch flat screen LCD TV with satellite channels and DVD player. The fourth bedroom is a separate traditional gladak overlooking the pool and garden.